This is a foreign exchange guide to South Korea, the South Korean Won currency plus KRW transfers and travel tips. South Korean Won exchange rates - latest & historic exchange rates. What is the South Korean Won currency code and symbol? The three letter currency code for the South Korean Won is KRW and the symbol is ₩. It is the domestic currency in South Korea. The won replaced the South Korean hwan at an exchange rate of 1 hwan to 100 won in 1953 following the Korean war. The won is subdivided into 100 jeon. A single unit of won is worth little in comparison with the currencies of other advanced economies. Between 1990 and 2017, to buy a single US dollar always required at least ₩900. At points of major won weakness – December 1997 and March 2009 – buying a single US dollar required ₩1900 won and ₩1600 respectively. Given the almost worthless value of won and jeon coins, in 2017 the South Korean government began a trial with selected stores intended to move the country towards being a coinless society. These stores no longer return coins to customers but instead deposit the coins’ value onto prepaid cards, such as those used by South Koreans on public buses and trains. Despite the South Korean economy being larger than that of Australia and far larger than those of Switzerland and New Zealand, as well as being advanced, the won is considered a far riskier currency to hold than any of the FX ‘majors’ – a group which includes the Australian dollar, New Zealand dollar and Swiss franc. This is in large part due to the ever-present strain between North and South Korea, which frequently threatens to spill over into a military conflict. For this reason, the won’s value typically falls against these majors (especially the Japanese yen, Swiss franc, US dollar, euro and British pound) during periods of economic uncertainty or when global geopolitical risk is elevated, or during bouts of high market volatility. The interactive chart below shows the USD to KRW exchange rate for the previous 3 months with rate alerts for days when the exchange rate moved up or down significantly or for 30 day highs and lows. South Korea is known to be a wonderful destination, the locals are welcoming, the countryside serene, and the cities high paced. The countryside ranges from spectacular mountains to tranquil villages. There is even the possibility to sail to remote islands. 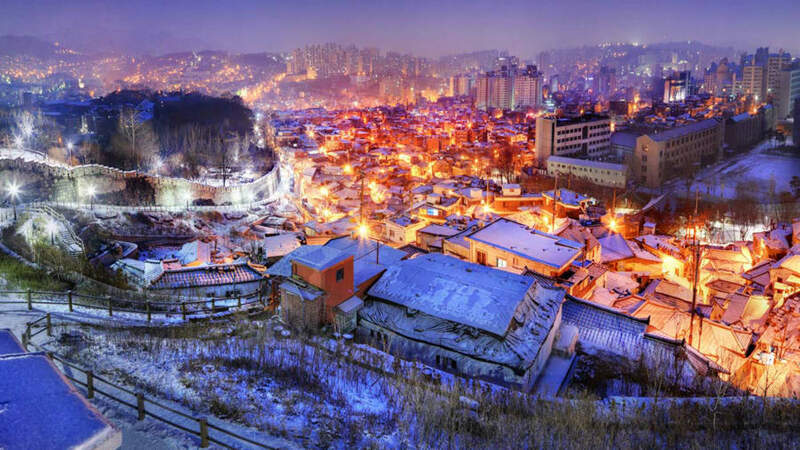 The countries capital is Seoul, a stunning round-the-clock city filled to the brim, where the ancient palaces and modern marvels stand side by side. South Korea’s compact size and superb transport infrastructure mean that tranquillity is always within easy reach of urban sprawl. Hike to the summits of craggy mountains – some of which transform into ski slopes come winter – enveloped within densely forested national parks. Get further off the beaten path than you thought possible by sailing to remote islands, where farming and fishing folk welcome you into their homes or simple seafood cafes. What currency is used in Soth Korea? Withdrawing money at an ATM or paying with credit card will always work in Korea. Some ATM's do not take foreign cards. But most ATM's in subway stations, convenience stores and major hotels always accept foreign credit cards and also foreign language options. Korea Exchange Bank (KEB) always have ATM's that accept foreign cards and menu in English. South Korea uses the T-money card to streamline payments for busses, taxis and the subway. Just recently they extended those payments for retail and restaurants, making it the most popular way to pay your way in South Korea. Like a debit card, it’s connected to your bank and makes automatic withdrawals each time you make a payment. You can use the T-money card on your smartphone, making payments as easy as a tap of your phone. From 2016–2018. South Korea is promoting travel with it’s Korea Tour Card. For less than $4, it’s offered to tourists for all the benefits of the T-money card, but with additional discounts to tourist attractions and shopping. The best way to bring money into Korea is exchanging your local currency into US Dollars or Euro. You can exchange most currencies into Korean won via any major banks or money exchangers in Korea. However, you may have trouble exchanging some particular currencies (e.g. Chile, Cuba, Iraq, Libya, etc.) as local banks in Korea do not provide exchange service for those particular currencies. While there are ATMs everywhere in big cities like Seoul, they can be sometimes hard to find in the villages, so if you plan to stray a little off the beaten path, be prepared to take plenty of local currency with you. Even in Seoul not all ATMs will work with foreign cards, be sure to check that it is specially marked for Global Cards. Mobil payments are wildly popular with the youth in South Korea. SO load your credit cards onto your smartphones and leave your credit cards back at the hotel when you go out in big cities. That said, always carry a bit of cash on you for tips or smaller restaurants and street food. Getting around in South Korea? There are plenty of Taxis and subway stations so getting around this energetic city is not a problem. For getting around locally South Korea has very good public transport so feel free to grab a map and have a look around with the locals. The Korean government promotes cycling as a green and healthy means of transport. Seoul’s metropolitan government has expanded cycling infrastructure in the city, including its own city bike scheme, Seoul Bike (www.bikeseoul.com), which visitors can use. For longer trips there are about a dozen different local airlines offering flights, the busiest air route being between Jeju Island and Seoul-Gimpo airport, so much so that there seems to be a flight every 10 minutes. The cheapest flights were offered by Jeju Air, Air Busan (a subsidiary of Asiana) , Eastar Jet and Jin Air. To book with all these airlines, you need to look on their own website to find their timetable, and then try and make a booking. These are all low cost, no frills airlines and they have a very low hand baggage allowance and you need to pay for any hold luggage you may have. The fast trains are the KTX system. The KTX service is a premium service so this is bound to be pricier than taking the slower train options. Save money and time by Ordering your South Korean Won online from Travelex, you get better rates and can pick up the KRW cash locally or even on travel day at the airport. For card purchases if offered a choice of currencies always select to Pay in South Korean Won otherwise you may get much worst exchange rates. Compare KRW travel cash rates - probably why you are here! When searching around for information on how to get a good exchange rate when sending money to South Korea you need to start with finding out the latest South Korean Won foreign-transfer exchange rate. What are the limits to foreigners when buying Property in South Korea? There are no limits when acquiring property but you are required to register your purchase to local authorities within 60 days. Purchases are subject to 10% VAT and 2% Acquisition fee. Agents charge fees roughly between 0.4 - 0.9%. Once your funds are received by the provider the converted KRW amount will be transfered to the recipient account you specify in South Korea. Use our Send to KRW calculator to compare the exchange rates of FX specialist providers rates versus your bank's standard rates you can hopefully save around 5% and maybe more - end result is more South Korean Won deposited into the recipient bank account and less margins and fees kept by the banks!